Acne Solution ClarityMD Review: Does ClarityMD Deliver Results? Clarity MD is a two-step acne treatment that helps treat root causes of acne. It is manufactured by Envy Medical, Inc. and consists of a deep pore cleanser and a clarifying serum. The complete kit costs $49.95 plus shipping and handling. The manufacturer offers a 60-day money-back guarantee on the product (minus shipping and handling fees). 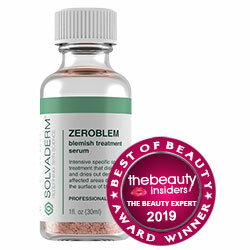 Salicylic acid (1%): This acid helps skin fight skin acne by removing dead skin cells. It is effective at exfoliating and is occasionally prescribed as an anti-irritant. It has many of the same properties as aspirin, is antibacterial, and is capable of cleaning pores because it can penetrate the skin deeply. Some studies show that salicylic acid increases thickness of the skin, boosts production of collagen, and makes it a more effective barrier. It also prevents blackheads and whiteheads. Perilla Ocymoides Leaf Extract: from the mint family, this plant has anti-irritant properties and is also an anti-inflammatory. Aloe Barbadensis Leaf Juice: This ingredient has been used for centuries to treat skin problems, provide moisture, and even remove acne scars. It is also rich in vitamins and minerals that can improve the health and appearance of skin. Use the cleanser and clarifying serum in the morning and at night. For the cleanser, wash skin using warm water and apply a small amount on the face. Massage for 1-2 minutes with the tips of the fingers or using a facial sponge. Rinse. Apply a thin layer of the serum after using the cleanser, especially concentrating on areas with blemishes. Avoid putting some in the eyes and wait until it is fully absorbed. Moisturizer or sunscreen can be applied after the serum. The two step formula uses salicylic acid, an ingredient known to be effective in stopping and preventing acne. The manufacturer provides a 60-day money-back guarantee for the product. The ingredient list is available online. No microbeads are in the product. The product is also cruelty-free. Some customers might receive a free sponge to use with their cleaning kit (depending on manufacturer promotions). A PDF of clinical studies conducted by laboratories are available online for client download. The product may not be suitable for people with aspirin allergies. The amounts of ingredients (except salicylic acid) are not disclosed. Clarity MD 2-Step is an acne-treatment system that is safe to use on a daily basis. It includes ingredients known to benefit the skin and the price is fairly reasonable compared to other acne treatments in the market. The manufacturer also includes a sponge customers can use for the cleanser to maximize effectiveness. The product’s website also has a link in which customers can download studies conducted on the 2-step formula. Still, the main ingredient, salicylic acid, is similar to aspirin and those who are sensitive to it may have to consult a skin care professional before use. A product that is free of this ingredient may be a better option for such customers.